29 April 2016, Comments Comments Off on Return of the Native? Welsh surfer and ocean activist Laura Truelove recently helped lead a beach clean with nearly 70 children and teachers from a Swansea school – and staff from A Rocha UK’s partner St Madoc Centre, Llanmadoc. Kathryn Britton of Keep Wales Tidy also assisted with the two-hour clean-up. This marine task force gathered more than 30 bags of rubbish from one of these islands’ most spectacular shorelines. 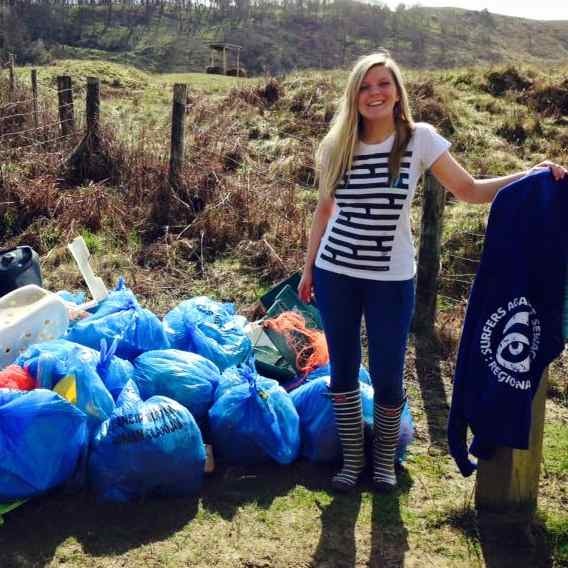 ‘Among the rubbish, there were all sorts from glass and plastic bottles to lighters, fisherman’s rope, cotton bud sticks, and even the odd shoe,’ said Laura (pictured), a representative for Surfers Against Sewage.